Researchers — who struggled for several years to build electronic circuits out of graphene with very limited results (except for radio-frequency applications) — have now succeeded in making a variety of electronic components from an amazing new material: a 2D version of molybdenum disulfide (MoS2). The MIT researchers say the material could help usher in radically new products, from whole walls that glow to clothing with embedded electronics to glasses with built-in display screens. Like graphene, itself a 2-D form of graphite, molybdenum disulfide has been used for many years as an industrial lubricant. But it had never been seen as a 2-D platform for electronic devices until last year, when scientists at the Swiss university EPFL produced a transistor on the material. Yi-Hsien Lee, a postdoc in associate professor Jing Kong’s group in EECS, found a good way to make large sheets of the material using a chemical vapor deposition process. Lee came up with this method while working with Lain-Jong Li at Academia Sinica in Taiwan and improved it after coming to MIT. 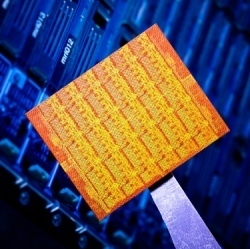 Palacios, Wang and Yu then set to producing building blocks of electronic circuits on the sheets made by Lee, as well as on MoS2 flakes produced by a mechanical method, which were used for the work described in the new paper. Wang had been struggling to build circuits on graphene for his doctoral thesis research, but found it much easier to do with the new material. There was a “hefty bottleneck” to making progress with graphene, he explains, because that material lacks a bandgap — the key property that makes it possible to create transistors, the basic component of logic and memory circuits. While graphene needs to be modified in exacting ways in order to create a bandgap, MoS2 just naturally comes with one. The lack of a bandgap, Wang explains, means that with a switch made of graphene, “you can turn it on, but you can’t turn it off. That means you can’t do digital logic.” So people have for years been searching for a material that shares some of graphene’s extraordinary properties, but also has this missing quality — as molybdenum disulfide does. Because it already is widely produced as a lubricant, and thanks to ongoing work at MIT and other labs on making it into large sheets, scaling up production of the material for practical uses should be much easier than with other new materials, Wang and Palacios say. Wang and Palacios were able to fabricate a variety of basic electronic devices on the material: an inverter, which switches an input voltage to its opposite; a NAND gate, a basic logic element that can be combined to carry out almost any kind of logic operation; a memory device, one of the key components of all computational devices; and a more complex circuit called a ring oscillator, made up of 12 interconnected transistors, which can produce a precisely tuned wave output.